No Wawa here, but I love the name. And our convenience stores here need to start selling cards. NOW! Did you pick up any Tasty Kakes? I didn't know about Wawa until I moved down here from NY. There is one on every corner and well worth it. Tasty Cakes (or however they're spelled) are good too. But it was just a quick Wawa run for a drink that turned into two packs of baseball cards. I really miss being able to pick up cards at the convenience store. I miss the days of biking up to the Stop N Go to grab a fistful of wax. We need us some Wawa here! Some of the Casey's General Stores I've been to have cards, sometimes pretty decent selections considering it's a glorified gas station (that makes some pretty good pizza). 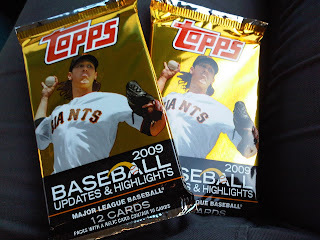 I really miss when Walgreens had (way marked down) packs around the turn of the millennium. Gotta love the Wawa...the coffee is good, I can assure you. Baseball cards too? Must be a local thing for you because they are a no go where I am sadly.